If you live in lionfish territory in the Atlantic Ocean, the last thing you want to be is a small fish with a long, skinny body, resting by yourself at night, near the bottom of the seafloor. If so, your chances of being gobbled up by a lionfish increase by about 200 times. Findings of a study on lionfish predation behavior, which may also apply to some other fish and animal species, have shed some new light on which types of fish are most likely to face attack by this invasive predator, which has disrupted ecosystems in much of the Caribbean Sea and parts of the Atlantic Ocean. The research has been published in the Journal of Animal Ecology by scientists from Oregon State University and Simon Fraser University. It used the study of lionfish to gain broader insights into how predators select their prey, and developed a new method for predicting diet selection across various prey assemblages. "With species now moving all over the world in both marine and terrestrial systems, we need to know who will eat whom when species encounter each other for the first time," said Stephanie Green, the David H. Smith Conservation Research Fellow in the OSU College of Science, who has done extensive studies of lionfish. "Normally, predator-prey experiments take a lot of effort and time," Green said. "But there are mathematical techniques that can help us better understand what is happening when we observe animals hunting in the wild, and why some species get eaten and others don't." Green said that researchers want to identify common features across the animal kingdom that make some species more vulnerable than others. "We're playing catch-up on this," she said. "However, with the case of species invasions, a much better understanding of which native species are at risk can help us target management intervention. This could help avoid extirpations and, in the worst-case scenario, more outright extinctions." This study is one of the first to identify general traits of prey that predict vulnerability to predation, and examine diet selection at different spatial scales. Some of the findings may be relevant to other invasive species problems, such as expansion of the Burmese python in the Florida Everglades and the spread of Asian tiger prawn into the Gulf of Mexico. The study also showed that although lionfish have a voracious appetite and will eat almost any fish smaller than they are, they do have their favorites. They find it easier to stalk and attack solitary fish, rather than those in schools. They like to hunt at dusk, near the bottom, and for some reason tend to avoid fish that clean off parasites from other fish species that are common in a marine environment. 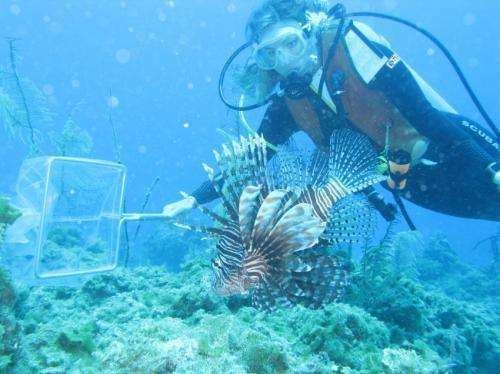 "Fish that clean parasites off of other fish appear to be avoided by lionfish," Green said. "Those that don't will be much harder hit." Having all the traits that make them vulnerable, for instance, raises a serious question about the ability of some species to survive the lionfish invasion, such as the Exuma Goby, a small fish native to one area of The Bahamas. 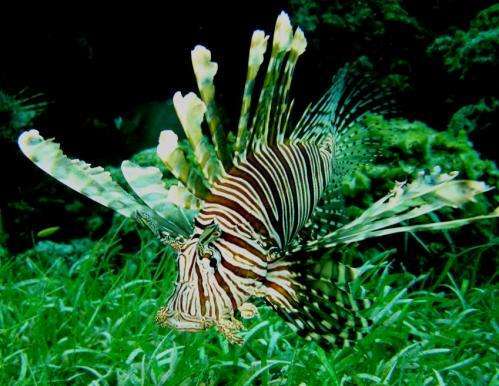 It has many traits lionfish prefer. OSU researchers are working with the International Union for Conservation of Nature to help identify some of the species and problem areas most at risk of extinction from the lionfish invasion, and where control of the invaders should be prioritized. Lionfish are now established on coral reefs across the western Atlantic Ocean, Caribbean Sea and Gulf of Mexico, and the invasion continues to spread while reef biodiversity and biomass rapidly declines. The high rate of fish mortality also poses an additional threat to coral reefs themselves, which can become covered with algae if enough fish are not present to eat the algae and keep it under control.